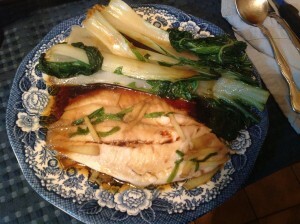 This can be made with almost any cut of fish from your fish monger or supermarket. 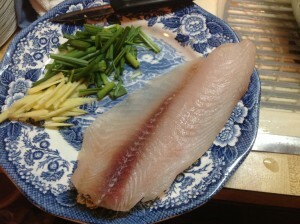 Any kind of mild white fish works well – swai, tilapia, cod. I usually buy what’s on sale at my local Stop & Shop – I know you could be a snob and get on me about buying farm raised fish from a supermarket, but whatever. It’s close and convenient. Honestly, this meal is usually a last minute thought when I don’t have a lot of time to plan. 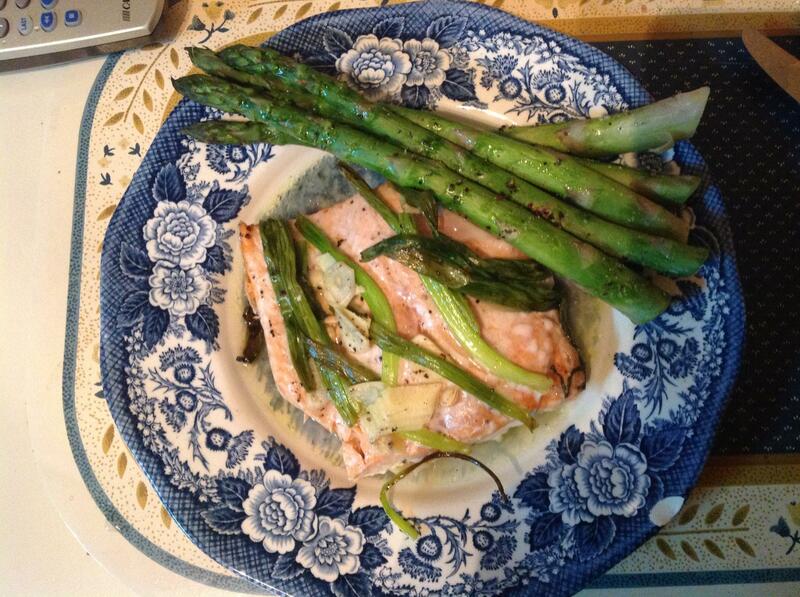 One thing though – it isn’t very good reheated, so I wouldn’t recommend it for a work-week lunch. 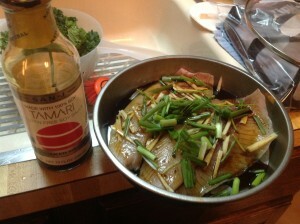 Gather your ingredients: 2-3 fillets of fish, ginger, green onions, garlic, tamari or coconut aminos, and sesame oil. Cut the onions and ginger into long thing strips. 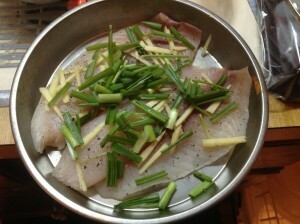 Layer the fish, ginger, green onions, and garlic in a small cake pan. If you have multiple fillets, you can set it up like a lasagna – fish > ginger > onions > fish > ginger > onions. Pour about 1-2 tablespoons of tamari over the fish. I don’t have an exact measurement because I usually just eyeball it. The more fish you have, the more tamari you use. Drizzle a little bit on sesame oil over the top to add some great flavor. 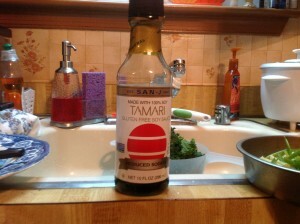 Yes, it absolutely has to be sesame oil because it has such a distinct and delicious flavor that nothing else will do. If you haven’t cooked with sesame oil before, beware: too much oil spoils the flavor. If you want to be safe, measure out about a teaspoon and drizzle that over the top. 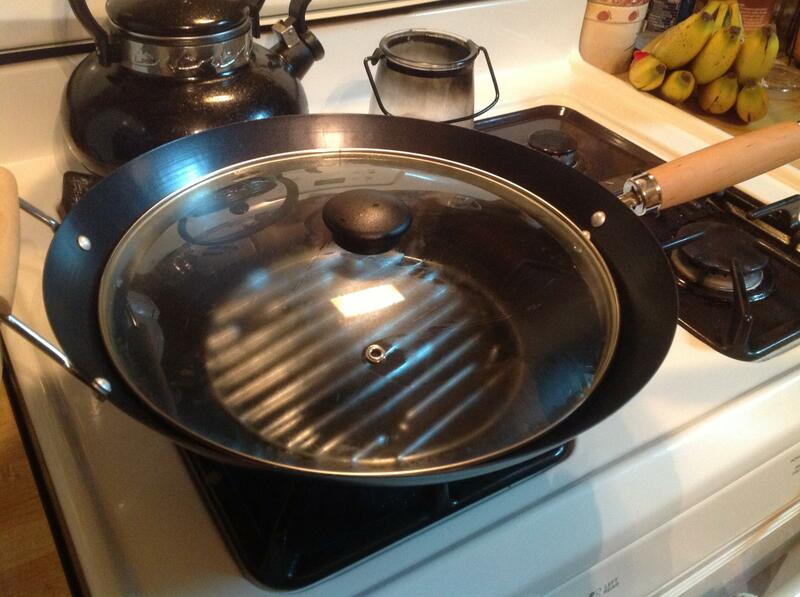 In a wok, add about 1-2 cups of water and a circular rack. This is important because the cake pan will sit on the rack and the water in the bottom will steam the fish. Cover the wok and let the water warm over high heat until you see steam forming on the lid. Add the cake pan with the fish and let cook for 15-20 minutes depending on how much fish you have. You’ll know it’s done when the fish flakes easily with a fork. I usually serve the fish with some stir fried bok choy or asparagus. If I wasn’t eating Paleo, I would have this with some fluffy white rice to sop up all the yummy juice. Because this is such an on-the-fly recipe, I don’t have a formal recipe. Hopefully this post will help you get an idea for a quick and easy weeknight dinner! Thank you for stopping by and Aloha!